DC-3 HK-2494 has crashed at San Carlos de Guaroa, Colombia whilst on a flight from San Jose del Guaviare to Villavicencio. All twelve people on board were killed. Did they perhaps try put it down on the road due to engine problems? From ASN of all authorities! I do know they have omitted some crashes but allowing this egregious error? The Douglas DC-3 aircraft impacted a rural dirt road near Villavicencio under unknown circumstances. The aircraft fuselage forward of the wings was completely destroyed by the post-impact fire. There are no survivors. The authorities .... "
"3" in Spanish is Tres. "9" in Spanish is Nueve. Not even close. Poor handwriting by reporter? "Dos-motor Douglas" airliner? 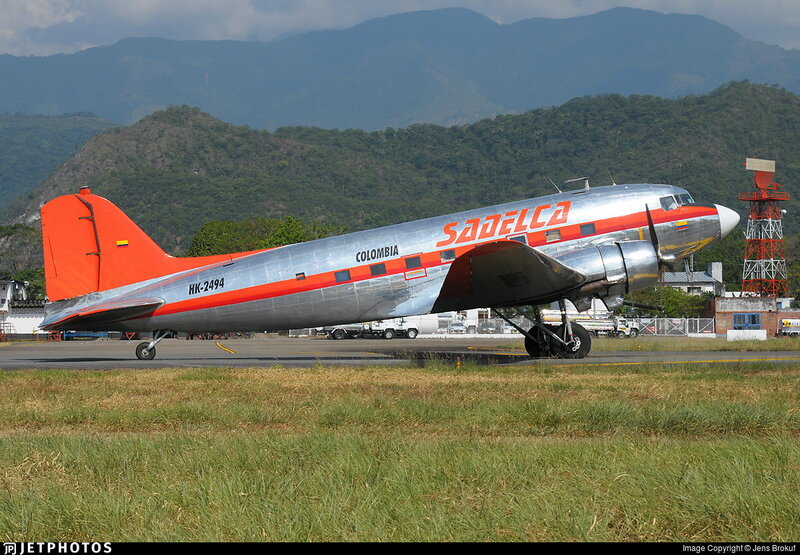 Maybe..
HK-2494 was indeed registered to a SADELCA Douglas DC-3. Aviation Safety Network (ASN) is currently listing this crash as a Douglas DC-3 built in 1945. Note that DC-3 production in 1945 was sidelined for production of military C-47 type(s). Last edited by evansb; 9th Mar 2019 at 21:00. Last edited by evansb; 9th Mar 2019 at 21:15. There are a number of older videos on YouTube of HK 2494. Probably not really relevant to this accident, but interesting. It was operated by L A S E R Aero in a mainly blue livery. There are more current photos of the aircraft on the net. A picture of the crash site from social media. A very substantial proportion of DC3s were originally built as C47s and sold into civillian service after the war. There are differences including fuel capacity, cargo doors and engine types. Aviation Herald says they apparently had time to declare an emergency and then "lost height." Nothing specific yet as to the exact problem. Also reports "DC-3" which yes, can also mean converted C-47. Did they operate as vintage aircrafts or actually ran a scheduled service ? All DC3/C-47 left flying in Colombia are working aircrafts. Basler (turbine Dak) are either with their Police or Air Force. How can a flying AC "plunge" into ground WITHOUT a trace at its back??? Looks like he landed on the road from right to left and either deliberately or inadvertently ground looped 90 degrees to the right. 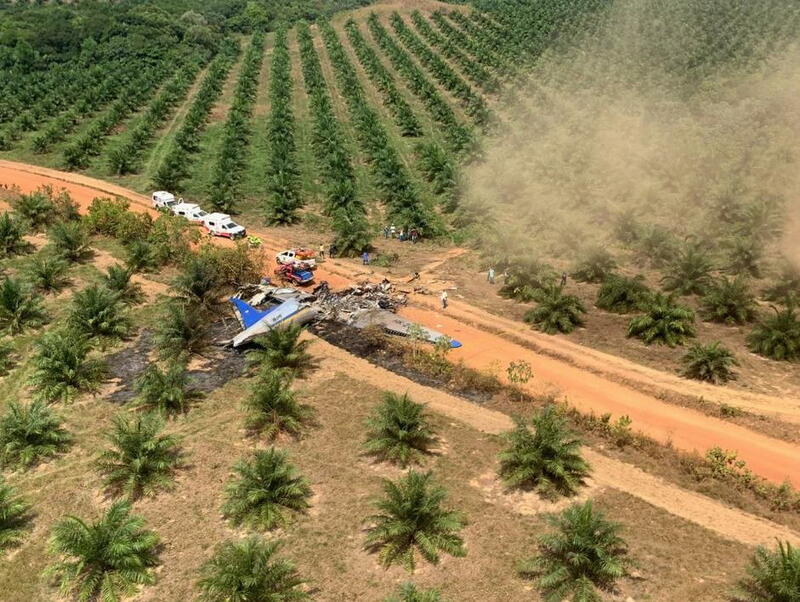 The vegetation on the "left" side of the road is looking rather beaten up with a short fire trail leading up to the final resting spot of the aircraft. Could also be that the short fire trail in the direction of probable approach resulted from burning fuel flowing down an irrigation ditch. I'm sorry but I do not see any trace of THAT plane landing on THAT road. More to it, the terrain on which the tail of the AC rests is about 1 to 1,5 metres UP the level of the mentioned road. And between the charred "irrigation ditch" and the road, are many young (and intact) trees. Looks as if it just dropped on that spot,probably fell flat in a horizontal spin at a relatively low speed and maybe already on fire.. Dropped vertically and put her six legs on ground. For the skyhook theory folks, how high does a DC-3 wing sit during a wheel landing? Might that account for the smaller trees mostly remaining to the right on the crash scene photo while immediately to the left of the crash scene, the trees are much larger? This is a tail dragger aircraft accident after all. I hope you understand the implications. Why put a twin engine transport down on a road in the first place? One of the best reasons in this case would be an uncontrollable engine fire. Did they announce the nature of their emergency? It should fly OK on one engine once solidly airborne. Look at this video to give you an idea at what Raptor System TT is referring. Just imagine the ground way much closer.